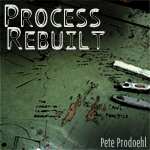 I recorded a song, and it’s called “Process Rebuilt” and I’d like to thank KeVroN and James and Jenn for inspiration… You should be able to hear it right on this page, using the embedded player below. Posted on Saturday, October 25th, 2008 at 6:50 am. Subscribe to the comments feed. Both comments and pings are currently closed. Post on your own blog.